I’m not noted for spontaneity but I do enjoy creating dishes spontaneously—when I have a stuffed pantry, a full rack of spices and a large refrigerator. Since I basically live on the road, I no longer have those luxuries. One night when I needed a very quick meal I found myself with bare shelves except for a lowly container of red lentils and a few odds and ends. That’s boring but it will have to do. So I started boiling the beans in some stock while I rummaged around for something to add to the dish. In 10 minutes the lentils were almost ready. I turned up some cilantro, various spices, salt and pepper. Still boring, earthy but one dimensional. I did find a few dates in the back of the cupboard. I chopped them up, tossed them in the pot just before the beans were done, and magic. I now had a sweet, exotic stew to counterpoise the earthiness of the beans. Add cumin and cilantro and I had a quick, simple dish in 25 minutes. Sometimes creativity requires a bit of luck. The dish has now become a staple for us, so in subsequent iterations, I couldn’t resist making a few improvements. With the caramelized onions to give another dimension to the sweetness, it’s no longer a quick meal. Leave them out if you wish. And a squeeze of lime gives the dish acidity. In doing a bit of research for this post I discovered lentil and date stew is a traditional Moroccan recipe (although typically a more complex recipe using tamarind). So I guess my dish is not really creative either. But it’s good. As for wine pairing, this dish has quite a bit of sweetness which will kill a dry wine. And the wine should have some earthiness to complement the lentils. In U.S. markets we don’t have a lot of options for semi-sweet earthy wines. If you can get a quality Italian Lambrusco that is not insipidly fruity that will work. My only option was an inexpensive Amarone from Trader Joe’s, the Conte Di Bregonza. It’s a big wine but the ripe fruit is sufficiently sweet to balance the sweetness of the dish and the earthiness brings out the warmth of the lentils. 1. Halve two onions and thinly slice discarding root end. 2. Cook onions slowly over medium low heat in 2 tablespoons unsalted butter, stirring frequently to prevent sticking, 40 minutes until deep brown. Salt to taste. 3. Meanwhile, dice remaining onion, add to a pot with a little oil, and cook over medium low until soft. 4. Add garlic and cook briefly, then add the stock and bring to a boil. 5. When the caramelized onions are 15 minutes from being done, add lentils and return pot to a simmer. 6. Simmer lentils until el dente, about 15 minutes and then add the dates and cumin. 9. Ladle stew into bowls, top with caramelized onions and cilantro. If there is one recipe that according to my family defines my identity as a cook it’s this macaroni and cheese recipe. I don’t like my identity being so wrapped up in one dish, but I guess they do get a say in the matter. It’s the dish that really signifies for us the comforts of home. I started making it 40 years ago with an old Fanny Farmer recipe, updated it with help of Betty Crocker, and then reinvented the dish to put my own twist on it. I recently went back and recooked all the iterations to see how the dish evolved. 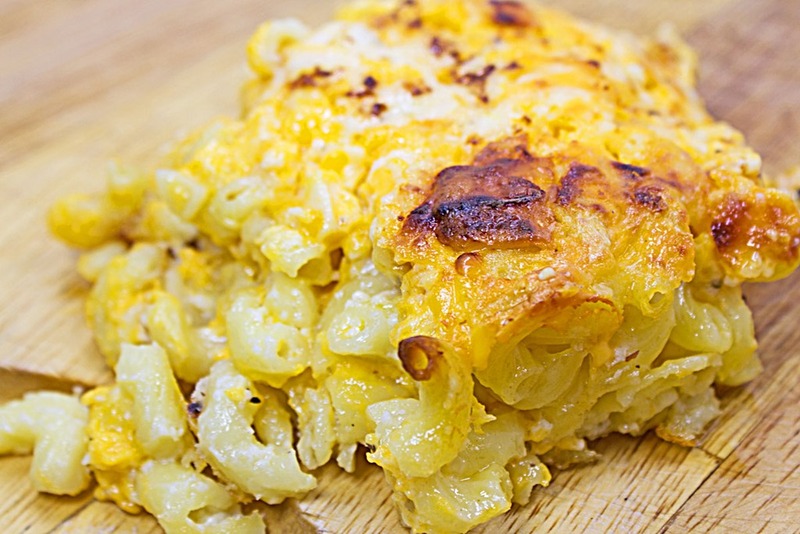 Macaroni and cheese has become a classic because it has all the markings of comfort food. The fat, protein and bulky carbs are filling. The macaroni is soft and, with the cheese, forms a homogeneous mass that is uncomplicated and accessible. The salt and fat are intense enough to send plenty of stimulation to the pleasure centers of the brain. 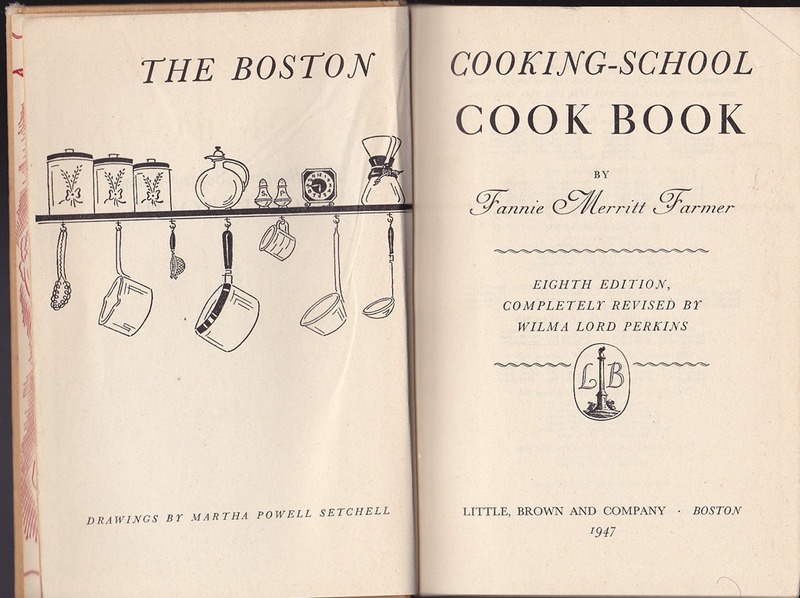 The Fanny Farmer recipe, which I think has been around since the 1947 edition of Fanny Farmer’s Boston Cooking School cookbook, surely qualifies as uncomplicated. The cheese is mixed into a béchamel sauce of cream and milk and is then mixed with the cooked macaroni, poured into a baking dish, covered with buttered bread crumbs and then baked. It is certainly soft and homogeneous but bland as reruns of the Partridge Family. The cheddar cheese sauce is creamy but has little bright cheese flavor since it’s cooked into the béchamel before baking which kills the flavor of the cheese. The bread crumb topping adds crunch but not much flavor. So I eventually went with a Betty Crocker recipe from the 1970’s. This recipe adds some grated onion which adds sweetness and a subtle contrasting flavor. The cheese is layered over half the macaroni and then layered again on top. Then the béchamel is poured over the whole casserole. The layer of cheese is not fully incorporated into the béchamel so the cheese flavor is much brighter than the original. 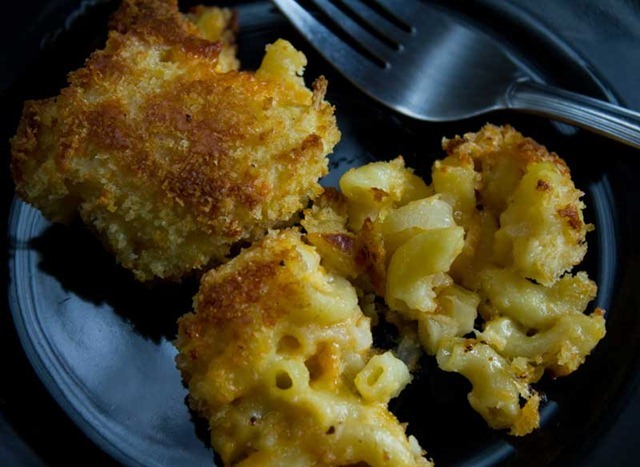 Instead of bread crumbs, the crunch comes from the macaroni, cheese and milk solids hardening and caramelizing at the top and along the edges of the baking dish. This forms some delicious “crusties” that will have you scraping at the baking dish with a knife to get every last bit long after the dish has been served. The problem? The flavor is still one-dimensional and the milk fats curdle adding graininess to the dish which now lacks the creamy consistency of the original. The graininess is made worse if you try to add flavor intensity by using very sharp cheddar. What I wanted was an exterior of crisp, caramelized cheese but an interior that is as creamy as I could make it. But remember those crusties? You need the milk solids and the flour to encourage that caramelization and browning on top. So I continued to use the béchamel/cheese sauce adding the sodium citrate just to prevent curdling and adding creaminess. Finally this year, to create even more flavor contrast, I added pieces of cooked bacon. I didn’t use bacon fat and I didn’t cook the bacon with the cheese sauce because the bacon flavor would be too dominant. I didn’t want bacon flavored macaroni and cheese. I wanted some bacon accents. And so now I have a macaroni and cheese that maintains the appeal of the traditional versions but with several innovations that improve it. Wine Pairing: Many experts recommend pairing mac n cheese with an oaked chardonnay because of its buttery flavors. But this dish is too sweet. It made Chardonnay taste thin and tart. The only way to go is an off dry to semi sweet German Riesling with apple notes. The Nik Weis St. Urbans-Hof Estate Old Vines Riesling Mosel 2016 is affordable and available. Cook bacon until crisp, place on paper towels to drain and reserve. Make white sauce: Melt 2 1/2 T butter over low heat. Blend in flour, salt, 1/4 tsp pepper, and dry mustard. Cook until smooth and bubbly. Remove from heat and stir in milk. Heat to boiling, stirring constantly. Add sodium citrate and then gradually add young cheddar and whisk making sure all of the cheese gets incorporated. Cook macaroni; place half of macaroni in ungreased 2-quart casserole. Sprinkle with 1/2 of onion, 1/8 tsp pepper, 1/2 of aged cheddar cheese and 1/2 apple. Pour 1/2 cheddar cheese/white sauce over macaroni. Then repeat adding the rest of the macaroni, onion, pepper aged cheddar cheese, and apple. Pour remaining white sauce/cheddar cheese sauce over casserole, insert bacon pieces throughout casserole, and dot with 1 T butter. Cover and bake 15 minutes. Uncover and bake 30 minutes longer or until you’re happy with the caramelization on top and sides of casserole. If the casserole is cooked through and you want more browning on top, place under broiler watching carefully to get desired level of browning. Much of modern art takes an ordinary object as its subject matter and transforms it into something extraordinary by placing the object in an unusual context. The edible arts are no exception. Although the tools of modern science give chefs the ability to fundamentally modify the form of ingredients, you don’t need a chemistry degree to create stunning effects. By playing with the function of an ingredient and giving it a new role and unexpected partners, chefs can transform how that ingredient is perceived. This dish by Gray Kunz and Peter Kaminsky from their book Elements of Taste is a good illustration of this principle. Cauliflower is almost always served as a side dish or a minor component in a larger dish. It seldom stands alone as a featured flavor platform. Mild and vaguely nutty when raw, when cooked it begins to smell like, well, funky feet, and without some serious dressing up with salt and butter or cheese, it just becomes insipid the more it is cooked. Only when roasted, does cauliflower begin to taste like food. But almost everything tastes better when roasted and a plate of roasted cauliflower by itself still adds up to a boring meal. But that “funky feet” flavor can be a welcoming host when the proper guests are invited to contribute. In this exotic main dish, cauliflower stars as a gloomy contrast to overly exuberant fruit. The fruit shows a different side as well. The taste of fresh fruit is equally dependent on acidity and sweetness. Yet, in cooking, we typically think of a fruity dish as highlighting sweetness, with sourness employed to achieve balance. This dish reverses that equation-the sourness of lemon plays a starring role but is kept in check by explosive contrasting flavors. Tasting notes: The foreground flavor is bracingly sour fruit, flavorful yet astringent, that permeates the broth and persists throughout the taste experience. Curry provides a persistent background note while the thin slices of ginger, with cumin and coriander kept whole to provide little explosions of flavor, keep the sourness from overwhelming. This flavor profile along with the cooling raita contribute to the exotic, vaguely Indian feel of this dish. Cauliflower is serving as a flavor platform and aspires to dominance without ever quite achieving it given the strong flavors of its partneers. The usual malodorous “funky” flavor of cauliflower becomes, in this dish, a mild dusky presence, like a gloomy twilight, that contrasts with the bright astringency of the sour fruit and sharp attack of the slices of ginger. 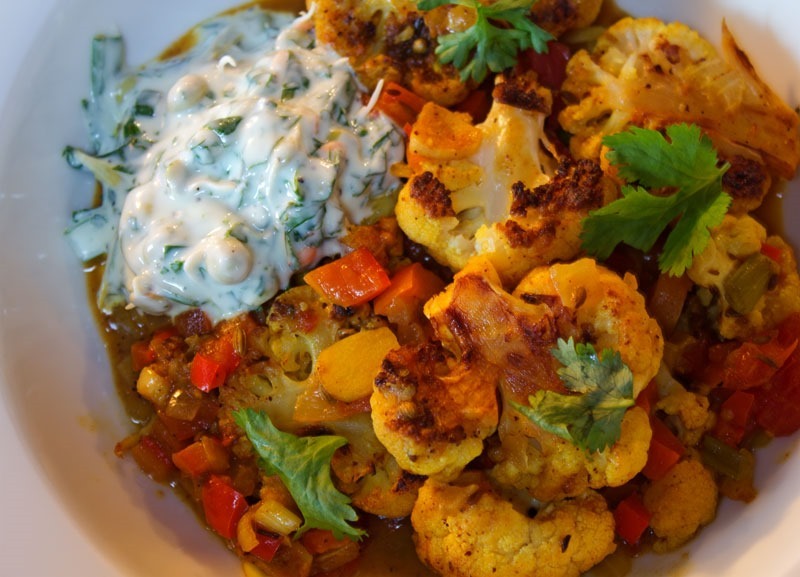 The cauliflower tempers the bright, assertive flavors preventing their high spirits from manipulating the mood of the dish, while the exotic spice mix masks the “funkiness” of the cauliflower allowing its dark, gloomy note to persist. While eating through the dish, the curry and yoghurt melt into the broth, gradually transforming the dish from an exotic exploration of sour fruit to something tamer and more comforting-until the slices of ginger punctuate, leaping to the foreground to pull us back toward exotica. As this battle between fruit and foreboding fades, the picante dimension of the ginger and pepper remains, perking up the palate in anticipation of another bite. The red radish is an afterthought. A colorful garnish or peppery accessory to a salad but seldom the star of the show. This strikes me as a great injustice. After all the radish is brightly colored, pleasingly plump, crunchy, and distinctively flavored. It’s not boring, offensive or unwelcoming. It doesn’t deserve to be ignored. I will make it my mission in life to rectify this injustice. The problem is that radishes lose their crunch and peppery flavor when you cook them. Boredom looms. But with just enough heat they acquire a pleasing nutty/earthy flavor that pops when you pair them with caraway seeds. One of the principles of fine cooking is to intensify flavor by removing water or anything else that would dilute flavor molecules. Much of the labor required to execute, for example, Thomas Keller’s recipes in The French Laundry Cookbook involves endless straining and reduction to squeeze every bit of flavor from ingredients. So when confronted with the problem of getting cooked fennel to taste like fennel I took some inspiration from Keller, although this recipe is considerably less labor intensive than anything in that tome. For this dish I wanted grilled chicken but accompanied by something different from the standard sauces and rubs. Think of this as sophisticated Q—but don’t tell barbecue fans, they will laugh. I love raw fennel but it is so fibrous it can be used only when thin slices are called for. Yet, when cooked to break down the fiber it loses its licorice-like intensity. Is there a way to get soft texture and big flavor? Yes, with some straining, reduction and a little help from flavor buddies like parsnips, ouzo, and fennel seed. 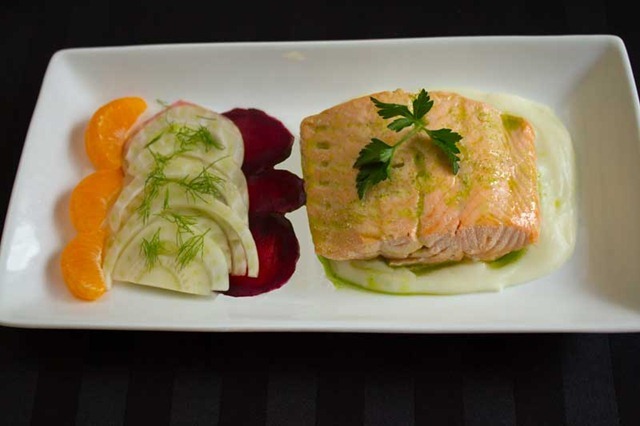 The briny olive purée is a perfect partner for the sweetness of the fennel—there is real synergy in their interaction. Separate them on the plate and allow diners to make their own perfect bite. Why begin a recipe with this brief excursion into music theory? A similar consonance is true of well-paired flavors. According to “flavor-pairing theory” ingredients that share flavor compounds will taste better together. This suggests an analogy with musical intervals. 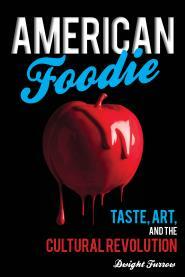 The more two ingredients share flavor compounds, the smaller the interval between flavors. Fewer shared compounds produces a larger interval and the flavors will not work well together. I don’t know if such a theory can be generalized, but pork and olives together got me thinking about it. I love pork and I love Kalamata olives, but they are not a marriage well-made. 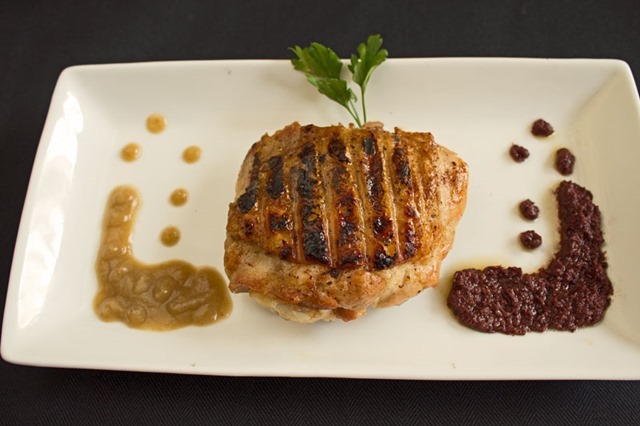 Few classic dishes rely on pork and olives as main ingredients. I haven’t sought out a flavor analysis of either but they seem worlds apart—separated by a large interval. The briny, sharp, vegetal flavor of the olives clashes with, when it’s not smothering, the mild, slightly sweet, “piggy” flavor of pork. Is there any way of getting them to work together in a dish? My hypothesis is that by finding “bridge flavors–other flavoring ingredients that go well with both pork and olives–I can reduce the perceived interval between them so they will then harmonize. Garlic, capers, and anchovies are often used to flavor both pork and olive dishes. That suggests a tapenade might function as the basis for a sauce; it will deepen the flavor of the olives and give them a mouthfeel that will blend with the pork. Orange peel enhances an olive marinade; it does similar work in pork stews and glazes. Thus, adding the orange to both the pork and the tapenade should pull them together. Goat cheese and thyme are also found in pork recipes and in olive preparations as well. Adding thyme to the tapenade will associate the olives with a flavor note we are accustomed to in pork dishes; and adding goat cheese will round out and soften the assertive olives. As to methods, slow-roasting a pork shoulder will take advantage of the Maillard reaction to ratchet up both the sweetness and intensity of the pork flavor while giving it a rich, fatty mouthfeel that will stand up to the assertive olives. 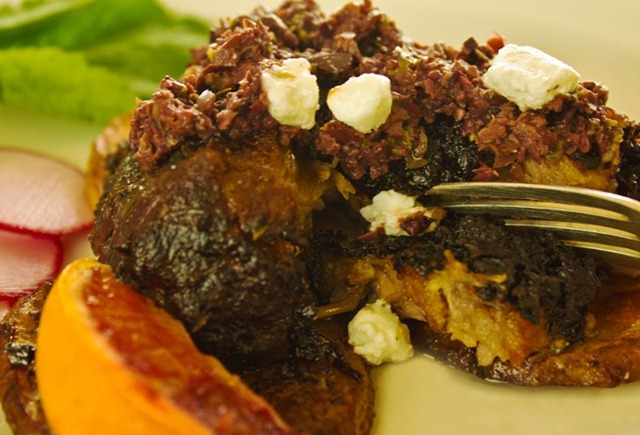 By covering the roast with a layer of tapenade the crusty surface will provide a layer that integrates pork and olive flavors, and studding the roast with garlic and orange peel will increase the flavor notes shared by both main ingredients. Lastly, let some sliced potatoes soak up the pan juices toward the end of the roasting process. The result—think pulled pork goes Mediterranean. Quite delicious if you’re an olive freak and a marriage that just might last. 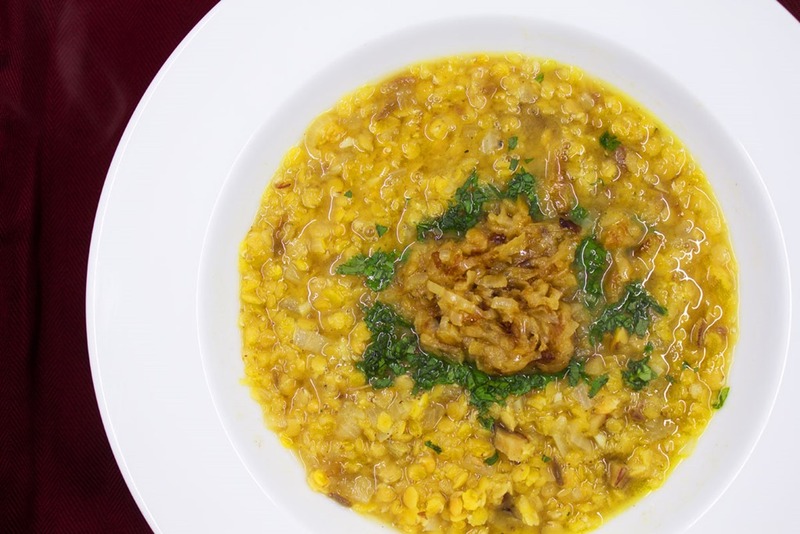 Risotto is one of the finer things to come out of Northern Italy. It’s versatile—you can make a risotto out of almost any vegetable, herb, seafood, or meat and it can be a side dish or a main dish. My CSA delivers beets in abundance so this dish arises out of the constant need to find interesting ways to use them. With a little fennel seed to add depth to the flavor, I use this as a mid-week supper dish. The color is enough to enliven the evening. And don’t forget the greens. They are delicious and it’s a shame that supermarkets often sell their beets without them. You can mix the greens into the risotto but that will bury their flavor. I prefer them as an accompaniment. Risotto has to be stirred frequently if not constantly. This allows the starch to leach into the liquid creating a creamy sauce while leaving the grains of rice slightly chewy. A medium grain rice works best. The longer the grain the less creamy and more chewy the risotto will be. Carnaroli rice makes very chewy risotto. Arborio is less chewy and creamier. The key is to add hot broth gradually making sure the rice absorbs the liquid before adding more. The rice should be fully cooked but firm. 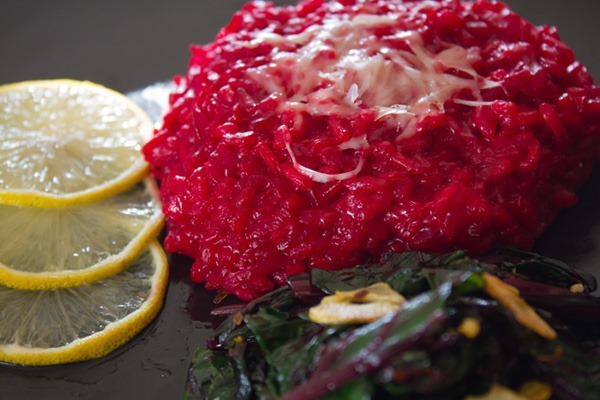 There is a great debate about whether risotto should be served with a loose, soupy texture (called all’onda) characteristic of Veneto or with a thicker consistency more typical of Lombardy or Emilia-Romagna. My version is the thicker sort. When fish gets anywhere near heat it starts to leech water. 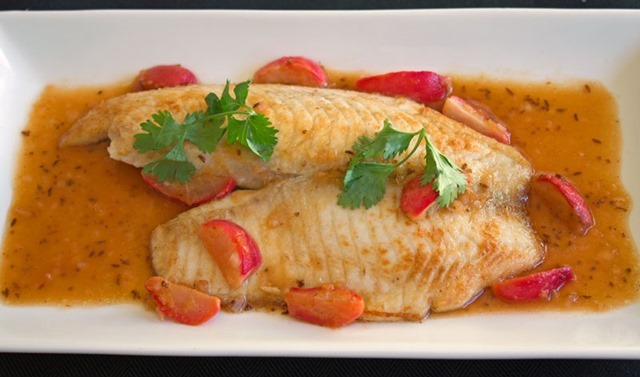 So how do you get light, moist, aromatic fish that retains most of its juices? Cook it slowly, fully immersed in olive oil. And since oil doesn’t like water and the water stays in the fish, it won’t absorb the oil. The flavors for the components of this dish were suggested by François Chartier, a principle advocate of the view that foods and wines that share chemical compounds pair well. Hence the parsley and mint oils, parsnip purée and sliced fennel paired with a New Zealand Sauvignon Blanc, all of which contain chemicals which exhibit to varying degrees the licorice-like flavor of fennel. (The tangerine and beet garnish were added for color). It is too early to pass a verdict on Chartier’s thesis but these components did pair well. The Sauvignon Blanc (reviewed here) was a perfect match for the parsnips and a satisfactory partner with fennel. But much depends on relative amounts. The parsley and mint oils were too subtle and disappeared beneath the gooseberry onslaught of the wine. Every fast food restaurant advertises their “crunchy fries”, fried chicken must be crispy, an apple only worth eating if its crisp. The difference between a potato chip and a pedestrian potato slice? Crunch. So to celebrate crispy week and to honor the brave crickets who sacrificed for our gustatory development, I give you Macaroni and Cheese Balls—macaroni and cheese rolled in breadcrumbs and baked so that every forkful will give you the crunch we all crave. 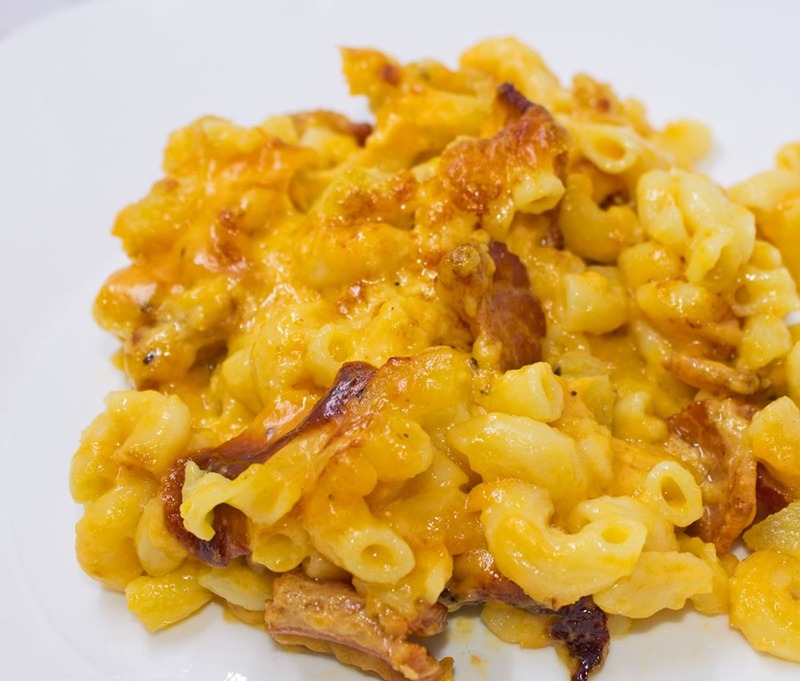 This recipe calls for using Kraft Mac n’ Cheese from a box. Since that brings back unfortunate memories of $10 per week food budgets in college, not to mention the salty, chalky, fishy flavor of the plastic cheese, you should use your favorite homemade recipe. 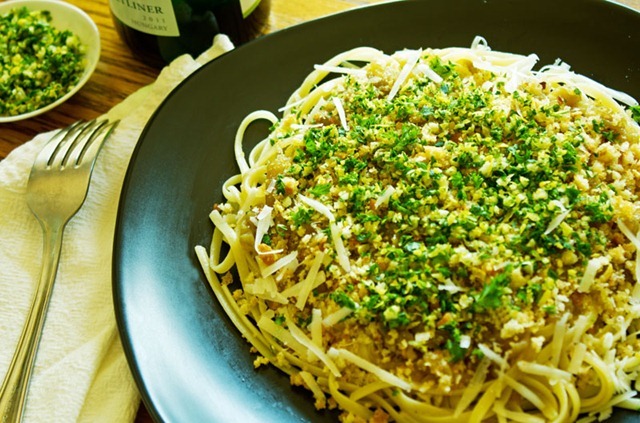 And add some freshly-grated parmesan cheese to the breadcrumbs.